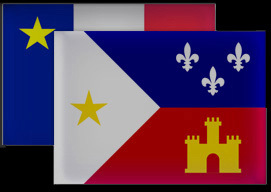 en anglais: Long Live Acadian Louisiana! 1604 - 1755: l'Acadie, Nouvelle France, Nova Scotia. The Acadians are caught between the territorial disputes of France and Britain. The British imprison and deport the Acadians. The Acadians are imprisoned, forcefully deported and exiled from their homeland. Most are deported and held in the 13 colonies until 1763. Acadians are exiled and scattered throughout the 13 colonies and various places around the world. 5. 1764 - 1785: The Acadians find refuge in the Louisiana territory. Acadian home in the 1st Acadian Coast (St. James) and Attakapas Post (St. Martinville). We are a centuries old, vibrant culture kept alive against great odds! Our French Cajun ancestors were forcibly removed from l'Acadie (Nova Scotia) during the brutal deportation by the British which scattered the Acadiens is known as the Le Grand Derangement of 1755. Many found refuge in Louisiana where we are now known simply as Cajuns. Here we celebrate our colorful heritage, our refusal to be culturally assimilated & the preservation of our language! Please understand that this site is a labor of love and remains under construction. Some links have been placed in preparation for upcoming pages and research.